Greetings from the Chair’s Desk! Is it wrong for a potential Worldcon Chair to already be thinking past the Worldcon they hope to help bring together? In this case, I hope not. I was very pleased to hear the European Science Fiction Society announcement that TitanCon 2019, the Belfast based bid, won the right to host the Eurcon in 2019 just last month in June. As a hopeful chair of a Worldcon Science Fiction Convention, I feel it is incumbent upon me to be welcoming and open to working with whatever bid wins the Eurocon. Belfast was uncontested in their efforts but even so, it is proper to be impartial. Now that Belfast has won their bid, I can hope and be excited about the prospect of a huge number of fans going from the Dublin Worldcon up to Belfast as the TitanCon 2019 is the weekend after Dublin 2019. This is hugely exciting for me. I was heavily involved in Loncon 3 in 2014 and helped with Shamrokon, the Dublin based Eurocon that occurred the weekend after Loncon 3. It was fabulous to be able to take so many fans to Dublin, and we brought a Double Decker bus load around the Convention Centre Dublin. 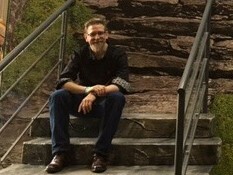 The weekend was a great relaxation for all who had just worked a Worldcon and for fans from across the world it allowed a level of co-ordination that was spectacular. And now we have that fabulous opportunity with Dublin and Belfast, all going well for our bid. 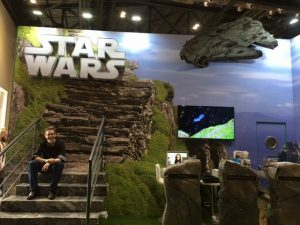 Hosting a Worldcon in Ireland, is motivated by many thoughts and feelings, but showing fans from across the world the country, its beauty, the wonderful scenery, and indeed the now famous sights, be it from Game of Thrones, Excalibur, Star Wars or The Eliminator*. I truly hope that fans take the time to see how heart stoppingly beautiful the country is. Here is just a short video of some of the Game of Thrones locations. Jo Playford and Phil Lowles have been working hard. The SF community on these islands is small enough, that it becomes obvious when hard graft and serious efforts are being made, and I congratulate them on their success. I look forward to seeing their plans evolve and come to fruition. 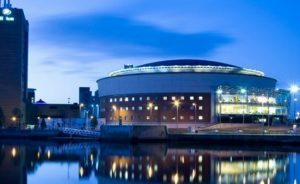 The venue for the convention, the Belfast Waterfront is a modern convention centre with considerable flexibility and their hotel is right next door, linked physically by a covered walkway. On the bank of the River Lagan, the venue is in the City Centre of Belfast, and indeed, less than 400 metres from Belfast Central railway station, which has a direct link to Connolly Station in Dublin which is itself a kilometre away from the Convention centre Dublin, so, well you only have to walk a mile between both venues. I could talk much more about the wonderful history of the ‘Enterprise’ service between Dublin and Belfast, the trains and stock, and the nice bar in Connolly station, over a coffee maybe. Feel free to geek out at the current stock here. There will be other plans for ways to get between both venues, and we will work with TitanCon to ensure our members have all the options available. I understand that TitanCon will kick off on Thursday 22 running until Saturday 24 August 2019 and then run their traditional TitanCon Coach Tour on Sunday 25 August visiting beautiful locations around Northern Ireland that have been used as filming locations in HBO’s Game of Thrones. This optional extra is highly recommended, again giving fans that opportunity to visit the country, and for those who are on a tight schedule, the chance to fully enjoy the convention and fly long distance home on Sunday. That would be some trip. Lots of information on TitanCon here. 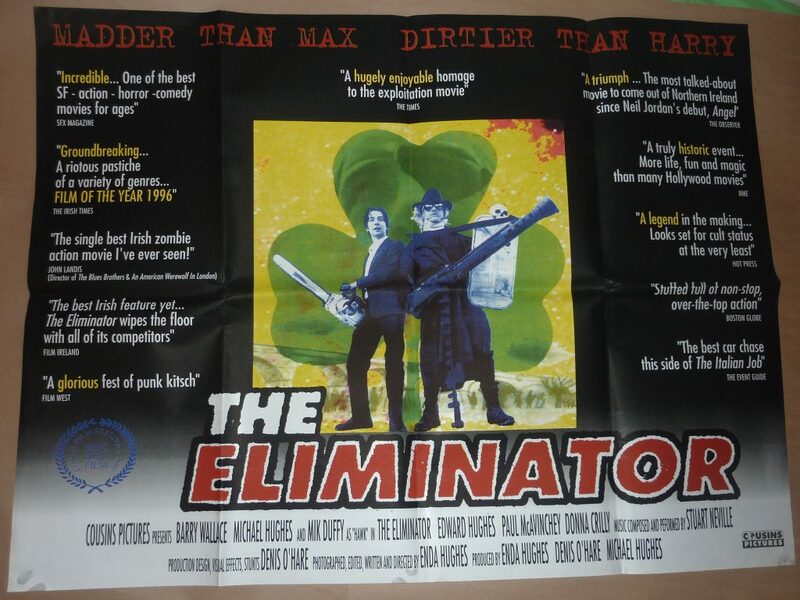 *The Eliminator is Enda Hughes and Mik Duffy’s wonderful crazy 1997 SF film, filmed and set in a future Northern Ireland. A computer genius, a military super car, a man with a huge cyborg-ish wrench for a hand, car chases in tiny fiats from the 80’s, Zombies, and the ultimate Zombie, a resurrected St Patrick. It’s beautifully chaotic, and passionately made, true dedication and effort, but copies are impossible to find. Can we find a copy I wonder?